The first wave of the 1918–1919 Spanish pandemic began in March 1918. The second wave, from September to November 1918, proved to be very fatal. A third wave occurred in early 1919. 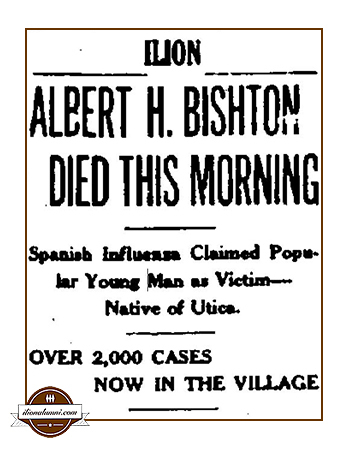 Like the rest of the world, the Village of Ilion suffered through this terrible epidemic and lost young alumni to the flu. "Some victims felt fine in the morning and were dead by night. Faces turned blue as patients coughed up blood. Stacked bodies outnumbered coffins....By winter 1919, the virus had infected one-third of the global population and killed at least 50 million people, including 675,000 Americans." - By Lauran Neergaard The Associated Press. 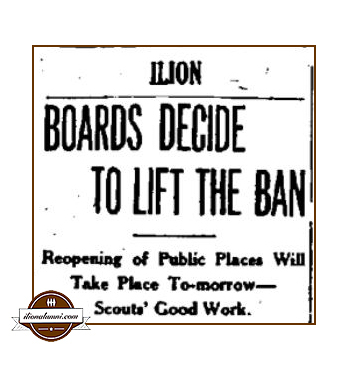 This Ilion Alumni featured story includes the actual text from newspapers published at that time. Fultonhistory.com provides an invaluable tool for researching local history. From the excerpts, you will gain an appreciation for the terror residents must have experienced 100 years ago in Ilion. Just a few years prior to the Influenza Epidemic, Dr. Charles Joseph Diss, IHS 1897, had been active in the establishment of the Ilion Hospital. He was the first physician to treat the first patient in the Ilion hospital. Additionally, he was a leader in the setting up an emergency Red Cross Hospital to treat victims of the 1918 epidemic. 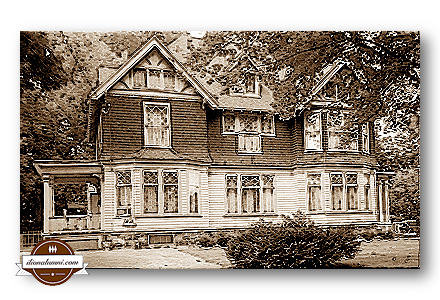 The temporary hospital was located at the former Calder home (later the W. E Best home), at 28 Prospect Avenue. "Here were brought the most critical cases, forty-eight in all. Of these, only three were fatal." Dr. Diss's expertise was very much needed in 1918. He maintained his practice of medicine and surgery in his Ilion office located in the Bedway Block. For over ten years, he acted as trolley surgeon. He established the first aid department in the Library Bureau of Remington Rand where many flu victims probably first received treatment. He also was in charge of accident cases at the Remington Arms Plant. Lastly, Dr. Diss examined many of our local draftees in World War I and World War II. You can zoom in to see this copyright protected 1906 map of Second Street and Prospect St in Ilion. 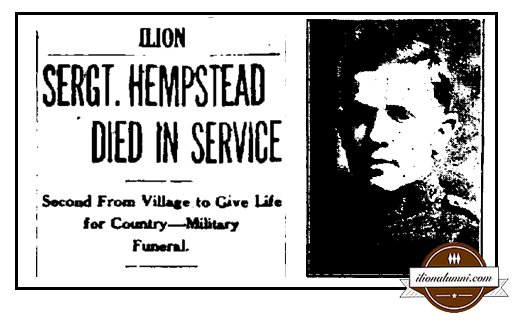 William Hemstead, home address of 51 High Street, died on February 21, 1918, at Camp Greene, S.C., of flu related lung failure. He was a victim of the first of three waves of the 1918 influenza epidemic. He was the second soldier from Ilion to lose his life in service during World War I." Sargent Hemstead graduated from Ilion High in 1917 and "...enlisted in the medical department, such was his patriotism and love of country." William Schletterer, home address listed as 112 W. Clark Street, died of influenza and broncho pneumonia on October 26, 1918. Harold 'Boots' Lever IHS Alumnus, presented The Lever Cup, to the school in 1924, as a tribute to William Hempstead - Class of 1916, and William Schletterer, former students in the High School, who lost their lives in World War I. This cup is given to the boy who has earned the greatest number of points based on scholastic and athletic work. For a list of honorees, visit The Lever Cup. Other Ilion servicemen who were listed as flu victims were John L. Scott of North Ilion and Leo E. McCoy of 212 E. River Street Ilion. 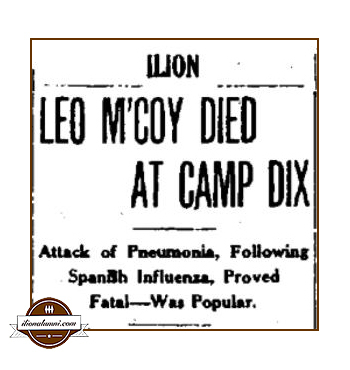 Private McCoy died, at Camp Dix, on October 7, 1918 following an illness of Spanish influenza which developed into pneumonia. Leo McCoy was one of triplets born to Mr. and Mrs. Edward McCoy on July 4, 1893. The other surviving triplet, Luke McCoy was in service in France. The third brother died before the war. His brother William McCoy, IHS 1911, was also stationed at Camp Dix. The brothers had left the village two months prior when they joined the service together. The epidemic was spreading through Utica and the surrounding villages. Ilion's Health Officer Dr. F. B. Conterman ordered the Board of Education to close the schools as a precautionary measure to stop the spread of the influenza. "The health officer. Dr. F. B. Conterman, stated that there are over 2,000 cases of influenza in the village and the physicians are working night and day and they do not have a moment's rest. In families where they are called they often find that from one to five are ill and some of the cases are most severe. The drug stores have been rushed as never in the history of the business. There is not one business or industry that is not affected by the malady on account of so many of the employees being ill. The epidemic has reached such proportions that the health department and the Board of Trustees held a special meeting last night and voted to close every public gatherings such as the theaters, public funerals, dances and meetings, the action taking effect immediately." 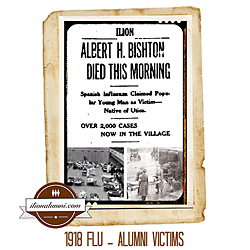 "Albert Hilton Bishton, one of the most highly regarded and popular young men of this village died at his home, 31 South Third avenue, at 3:20 o'clock this morning, death being caused by influenza from which he had been ill since a week ago last Saturday. The deceased was born in Utica January 14, 1888, and for 22 years had lived in this village. He was a member of the Baptist Church and was also a member of the Ilion Fish and Game Club which organization he was at all times deeply interested. He was employed at the plant of the Remington Typewriter works as an inspector." "Surviving are his wife who was formerly Florence Clark, one daughter, Jeanette, aged six years; father, Fred Bishton of Sacramento, Cal., and three brothers, Charles, Fred and Harry of Herkimer, and two sisters, Mrs. F. E. Busey of Sacramento, Cal., and Mrs. Louis Reuning of New Orleans, La. In the death of Mr. Bishton, Ilion loses a young man of worth and one who was among the type of citizens that are held in the sincerest respect." "Ilion. Oct. 9.— Health Officer Dr. F. B. Conterman stated this morning that the epidemic of influenza had not abated in the least and that every physician in the village has more than he can attend to. The work of the production at the Arms Company plant and the Typewriter Works is being greatly interfered with on account of so many of the employees being ill. The Health Department and village trustees and also the officials of the Remington Arms & Ammunition Co. have been busy today in an effort to have the surgeon general of the United States army Instruct Dr. F. J. Leonard to remain here until the epidemic is passed or can be handled with the other physicians, which at this time is impossible. Dr. Leonard was ordered to report for service and expected to leave tomorrow. His services here are badly needed." The physicians of the village warn all who have been afflicted with this disease to be exceedingly careful about going out too soon and to take no chances in that respect. It is much safer to remain indoors or in bed for a few days longer. A relapse of this disease is very dangerous. With the theaters and all other public gatherings closed last night, and also with the "lights out" order in effect, the village all evening had the appearance of a desolated place. Many of the business men who had been In the habit of keeping open closed at a much earlier hour and by 9 o'clock about every light was out excepting the street lights." This telegram was received at the Typewriter Works: Washington. D. C. Oct. 8, 1918. Influenza is interfering With our munition plants throughout the country. It is up to the men and women who are still on the Job to make good the loss of their comrades. Speed up. Your country needs every bit of your energy today for the men in France. 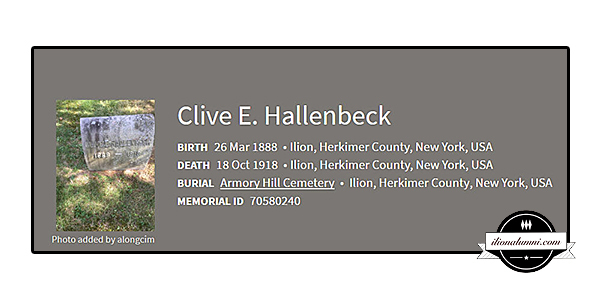 "Another death that has caused a shock to this community occurred this morning at 3 o'clock when Clive E. Hallenbeck died at his home on West Main street. He was taken ill a week ago yesterday with a grip cold and remained at home during the week and day before yesterday pneumonia developed and yesterday morning it was noticed that his condition was becoming critical and a consultation of physicians was called. Yesterday afternoon a change was noticed for the worse and early last evening he had a sinking spell from which he did not recover. His death is a bad blow not only to his wife, members of his family and relatives, but to all his friends. He was one of the best known young men in the village and was one of the best liked. Honor and uprightness and square realing were traits of his character. He was exceptionally popular socially, politically, and in fact, in every way, and his death will be a loss to Ilion." The 2018 Flu Season has been featured in national news stories because of its spread and concerns about the flu-related the death rate in children and young adults. The Associated Press article that was used in the beginning of this story also contains information about the future for the battle against influenza. Below is a summary from that article by reporter Lauran Neergaard. There's no way to predict what strain of the shape-shifting flu virus could trigger another pandemic or, given modern medical tools, how bad it might be. But researchers hope they’re finally closing in on stronger flu shots, ways to boost much-needed protection against ordinary winter influenza and guard against future pandemics at the same time. "We have to do better and by better, we mean a universal flu vaccine. A vaccine that is going to protect you against essentially all, or most, strains of flu," said Dr. Anthony Fauci of the National Institutes of Health Labs around the country are hunting for a super-shot that could eliminate the annual fall vaccination in favor of one every five years or 10 years, or maybe, eventually, a childhood immunization that could last for life. - By Lauran Neergaard The Associated Press. Take a moment during you next visit to an Ilion cemetery and check for tombstones with a death date of 1918. There you may find the graves of those mentioned in this article and other alumni who died during the epidemic. You can also search on-line using Find-A-Grave. As of today, 6,823 Memorials appear in the Armory Hill Cemetery. St. Agnes Cemetery has 772 memorials. The Ilion Cemetery 1918 burials are also listed on the Ilion section of the herkimer.nygenweb.net web site. For the year listed 1918, there were 93 burials listed. - herkimer.nygenweb.net/cemeteries/ilioncem4.html. Hopefully, with medical advances in vaccinations we will never experience another pandemic as lethal as the 1918 Spanish Influenza. You can do your part to protect yourself and your family by getting an annual flu vaccination.